Rate used in foreign t .-- \,* . approximately 5,800,000 bales had already been exported. In China and Japan, cotton mill consumption in April r-maineo steady. ther in April ond vxere the lowest for any April sincu 1932.
about unchanged to slightly lower. consumption was 7,950,000 bales in 1936-37.
cotton may become available for domestic consumption and export this season. facturers on April 30 this year were 180,000 bales larger than a year earlier. Domestic oriccs drop 1-1/4 cents then make partial recovery. the ten markets dropped somewhat to 10.02 cents. hi-,her industrial production air,- cottCr coG. co..:U -ticn in the United States. :Fine 0OnmVr.,l: F.G.F. Lnpcrs:Fair,Sao Parlo:Middling 7/8"
Ct. Ct. Pct. Ct. Pct. Ct. Pct. Ct. Ct.
to cents per pound at current official rates of exchange. as to possible war developments in the Mediterranean. 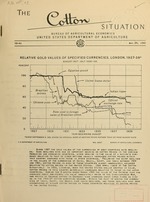 prices as of May 16.
era-e from August through April during the 10 years ended 1937-38.
bales to the corresponding date last season. ended July 1940. They may'now fail to reach this figure anyway. Includes Austria beginning January 1938. / Not available by countries. have been materially below production throug-out most of this period. th., de..and for rany types of cotton cods, if not this season, then later on. tivel;- in the corresponding periods of last season anc the season before. would drop somewhat below 7-3/4 million bales. which was only about one-half the 10-year (1929-38) average of 109,000 bales. may be lost as r.isri:ets for Arerican cttLon and competing foreign gro-ths. trade. In :'ay thl-1 restricticn cn salcs to British civilians was withdrawn. growing out cf military ."evclcpments. cotton in the production of goods for .he. home market. Attache, London, dated May ]..
thing like 1,300,) 00 bales would. be th'e annual rate for American cotton. of roughly 1 million bales. Cotton i-ill activity ini France during April remained on a high level. large bac':log of domestic trade :-ecuiroj;e'ntls is thcu-ht to have accumulated. proval of the Price Supervision Committee, yarn prices were raised accordingly. war even if operations in other regions of France are increased. restricted and most of this cotton used for other purposes. of Russian cotton for the German-controlled area has become available. while the I"B" or cotton typos of standard quality cost about 1.45 mars. staple fib. : from this plant. had up to th-.t tire boon concluded, so far as could be learned in Barcelona. the tino tle renprt from Shanghai js, received .aout the middle of M:y.
middle of 1935 oand some 14 to I- perce-t smaller than the year earlier. the reccrd high consumption for the cjrrcs.ond'ing period last season. the Govu'rnment restriction on cotton consumption by Ja-,anose civilians. altho-gh smaller than in any other ccrresonding period since 1933-34. War, and increased manufacturing costs in Japan. is expected because of comparatively less serious handicaps. cotton to Japanese buyers at fixed prices below the "world" market level. of 1940 acreage will be released on July 8.
or financed cotton were nearly 2- million bales caller than last year. low through "'ay 23 despite a substantial recovery in spot prices. cents a pound on 1938 cotton, a.nd 3 cents on 1939 cotton.